Here are some more images from the set of figures done completely with oils. As I have discussed in previous posts, the advantages offered by oils have been very nice to work with! 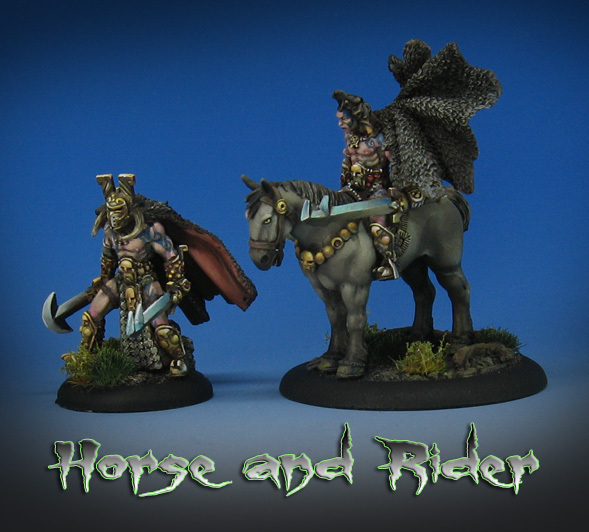 I already talked about those hard to reach areas, etc., but this set of images shows how much fun you can have with NMM and painting something like the horse. Both of those elements have a lot of subtle color transitions, and being able to blend that wet oil paint across the surface was a huge help! The horse had a lot of decently sculpted musculature on it, as well as a good face. Getting the tan/grey fur colors to transition into the much darker colors on the legs was a matter of blending, as opposed to several layers of glazing! Here's a live session that really shows how this blending works!